We’re now just less than three months away from the release of the final installment of the Hunger Games franchise. 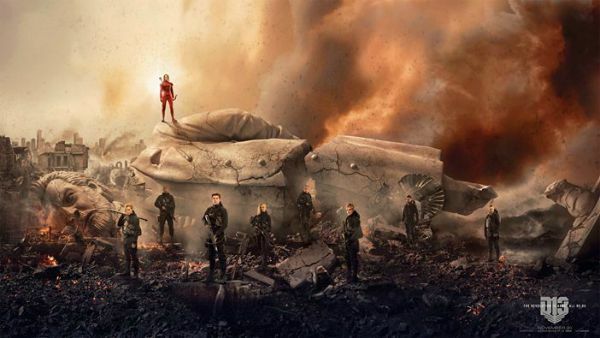 The Hunger Games: Mockingjay – Part 2 will finally bring an end to Jennifer Lawrence’s antics as Katniss Everdeen, and to amp up anticipation ahead of it hitting cinemas Lionsgate have now released a final banner poster. And it looks rather spiffing. When Snow falls, the Mockingjay will rise. The Hunger Games: Mockingjay – Part 2 kicks off with Panem in the midst of revolutionary war. Jennifer Lawrence’s Katniss Everdeen is looking to take down Donald Sutherland’s President Snow with the help of her close pals, which includes Liam Hemsworth’s Gale, Sam Claflin’s Finnick, and Josh Hutcherson’s Peeta. In order to complete their mission they must try and assassinate President Snow, who himself is now obsessed with taking down Katniss. As well as the aforementioned bevy of acting talent, the likes of Woody Harrelson, Elizabeth Banks, Jena Malone, Julianne Moore, Stanley Tucci, Jeffrey Wright, Natalie Dormer, Gwendoline Christie, and the depressingly departed Phillip Seymour Hoffman will appear as well. The next sequel in the Hunger Games series will bring the curtain down on the hugely popular franchise, which has so far grossed $2.307 billion across three films. And it’s probably safe to assume that the total will go over $3 billion by the end of the final films run in cinemas. And even though The Hunger Games books only consists of three books, which have been stretched across four films, there’s even been talk that there could be a prequel or sequel to Mockingjay – Part 2. Back in February the CEO of Lionsgate, Jon Feltheimer, admitted that there had been discussions about where they could take the story once the franchise was complete. Whether or not this is still being pursued is unknown, but if Hunger Games: Mockingjay – Part 2 does as well as expected when it hits cinemas on November 20th, then you can bet that the powers that be at the studio will return to the characters regardless of whether there’s any source material.